There is an old argument that goes something like, “Literature doesn’t actually do anything.” I’ve heard it lots of times, even way back in college English and writing courses, and Lit Crit classes both smart and smarmy, and oddly, perhaps, most often still from the mouths of other writers. Then again, maybe “argument” isn’t the right word, as I’m not really sure what it argues for — for beauty, I imagine. Literature is about beauty, not utility. But this has never made much sense to me and is about as useful as saying a saxophone or a piano doesn’t do anything, either. Well, of course not. You’ve got to play the thing. Klay’s response is not only completely unromantic (thank goodness), and honest, but just plain generous. It’s an attempt to bridge the gap that always exists between two separate lives, two sets of experience, two consciousnesses. And please note the requirement: imagination. Which I’m sure some would also charge has little practical value, and doesn’t really do much of anything. These are people I tend to avoid. In fact, Redeployment, Klay’s debut collection of short stories, does a whole a lot. Not the least of which is that Redeployment gives any willing reader the opportunity to imagine what it’s like to be a soldier, to be several soldiers, even several types of soldier. The experiences found therein are variously ugly and beautiful, often marked by violence and disillusionment, even boredom. They are philosophical and physical, sometimes disturbing, all of them complicated, and nothing less than human. We are a nation at war, have been for years, and Klay’s stories have made me better understand what that means. They can do the same for anyone, but of course you have to read the book. You’ve got to play the thing. He and I talked over midday coffees, evening beers, and email. Scott Cheshire: This is your first collection, was it always your plan as a writer to write a collection of stories? 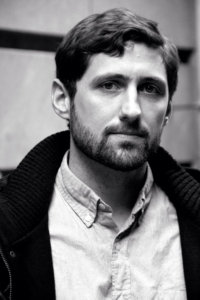 Phil Klay: The notion of having a collection of stories told from different perspectives came to me very early on. I felt that a singular, this-is-how-it-is book would not do justice to what I wanted to get across. Also, it wouldn’t allow the reader to engage with the work in the way I wanted them to. Each narrator’s experience of Iraq is constrained by the circumstances of their deployment — where they’re deployed to within Iraq, when they’re deployed, their specific job, their specific unit — as well as the way in which they choose to emotionally or intellectually approach their memories and think about the choices they’ve made. Aside from wanting to get beyond the more conventional images of war that flood our culture, I wanted to open a space for the reader to both be receptive to and to critically engage with the sorts of approaches these narrators take. Your experience as a Marine has been getting lots of attention, usually with regard to the writing, claiming a feel of “authenticity,” because you know what it’s like “over there.” I would argue your experience has affected the book in much deeper and more interesting ways, I mean motivationally, linguistically, and structurally. I’m not always sure what people mean when they talk about authenticity. The Iliad, for example, is kind of dodgy in its presentation of warfare in the 13th century B.C. Does this make it inauthentic? In a certain sense, sure, but that tells us little of the quality of the work. Is Catch-22 “authentic’? How about Gravity’s Rainbow? I don’t know, and I don’t really care. I hope my book is authentic, insofar as I did a lot of research and interviewed a lot of veterans and sent my stories out to a lot of people who knew something about the subject matter to make sure I was representing these different experiences accurately, but I’m about as concerned with verisimilitude as I imagine Jane Austen was with accurate representations of courtship in the 18th century. It’s important to get it right, for sure, but that’s not why you’re writing. So yes, my experience in the military had a lot of influence on the work in a variety of ways, but the biggest influence is simply the degree to which it made exploring the various themes of the stories vital for me. I got out of the military and went to New York, a city that does not feel like a city in a nation at war. And yet I knew Marines who were still going over, and sometimes having terrible things happen to them. It’s hard to wrap your head around, and yet it feels vitally important to do so. Each story felt personal. Each story felt deeply necessary to figure out and express and have people engage with. How do you feel about the “canon” of war literature? Does there seem a recent surge (forgive the pun) of war writing? Is this simply attributed to recent wars? It’s hard to talk about the canon of war literature because it’s so broad. We’ve been writing about war a long time, and there are as many ideas in the culture about war as there are about love, or religion, or any other part of the human experience. I don’t always separate it out. Anna Karenina and War and Peace are thematically much closer, for obvious reasons, than the poetry of Tyrtaeus and Wilfred Owen. And some of the books that have spoken to me most eloquently about experiences common to war are from books that aren’t about war at all, like Joseph Conrad’s Lord Jim. I think you’re right about there being a lot of really interesting war writing appearing. It makes sense — we’ve been at war as a nation for well over a decade at this point. Yes, exactly. There’s often a sort of mysticism about war, wherein war is supposed to be a kind of ineffable experience that forever separates the veteran from the civilian in ways that cannot be expressed. I’m very wary of those sorts of claims. They shut down communication and privilege the veteran’s interpretation of his own experience without exposing it to any kind of outside judgment. And ultimately, they isolate the veteran. So, yes, that’s a much-quoted bit, but I’m not sure how much the story itself supports it. The didactic bits very deliberately clash to get at the complexity of approaching a subject as broad as war. As far as comparing those stories, I think a key difference is in the stance I want readers to adopt toward the narrator. O’Brien is explaining to the “sisters who never write back and people who never listen.” He’s throwing all these paradoxes onto the page and pointing to the apophatic, but ultimately I think he himself remains a fairly stable authority in the text. The narrator of “Bodies,” though, is not. He’s been inside the experience for a long time, as those lines suggest, and is now telling this story and trying to get a handle on it. Well, the narrator of that story specialized in Psychological Operations. He’s well-versed in the ways in which words and cultural notions can be practically employed. At one point he refers to words as a technology, and himself as being part of a “weapons system.” The military employs psychological operations specialists because they can create tangible effects on the battlefield. And what is true in war is also true in civilian life. All the powerful notions floating around about the veteran experience, about race, about gender, about class, about whatever it is, have a deep impact on his life. They frustrate him, but he also knows how to take advantage of them if he needs to. The ‘veteran mystique’ is one of those notions that he doesn’t believe in personally, but he does understand how it operates in the culture enough to use it. You often immerse the reader in the culture of jargon and acronyms — one story is told almost entirely through acronyms. Jargon and acronyms are a part of the language of modern American warfare. Plus, the language you use to express yourself says a lot about you, and a lot about your relation to your audience. The two stories that are the most acronym heavy are “FRAGO” and “OIF.” “FRAGO” is told very close to the action, and is non-apologetic about having a tactically-oriented mindset. “OIF,” on the other hand, has a character very self-consciously embracing a military mindset and accepting the ethical demands he feels it places on him. The acronyms were essential to both stories, but it was also essential to me that a non-military reader could follow along. Besides, I’d say most veterans don’t even know every acronym in OIF. And that’s important too. You don’t just have a language of acronyms unique to the military, but different specialties within the military have their own vocabularies unique to them as well. Fairly early on I knew that “Redeployment” would be the first story and that “Ten Kliks South” would be the last. It felt like they had the right resonances, and the right beginnings and endings. Writing the book, I was driven a lot by intuition, and a lot simply by my interests, reading-wise. I was constantly writing toward something, and directing my reading and the people I sought out accordingly. There were different pieces that I knew I wanted in the book even if I didn’t know how I’d get them there, and eventually I had a group of stories that I was working on that felt like they fit together. As for the resonance with bodies, yes, it was very intentional. Both stories involve the act of killing, but whereas in the first story is it much closer and more personal, “Ten Kliks South” is abstract — an artilleryman part of a crew that has fired on a position six miles away from them, and which he has not seen. So he’s parsing out what that means, and what his relation to it is, ethically and emotionally, and how far that chain of responsibility reaches. Some of the longer stories, like “Prayer in the Furnace” approach the length of novels. I generally didn’t set out to write a long or a short story. I started out with a few ideas, or a voice, or a couple of images that seemed to talk to each other, and then I followed that as far as I could. Some stories demanded a longer arc. “Prayer in the Furnace” takes place over a couple of years. The characters needed time and space to work things out. The chaplain in that story is one of the most complicated characters in the collection. A moment from one of his more ambitious sermons: “We are part of a long tradition of suffering. We can let it isolate us if we want, but we must realize isolation is a lie. Consider Owen. Consider that Iraqi father and that American father. Consider their children. Do not suffer alone.” I find that “do not suffer alone” an incredibly moving and profoundly complicated request. Well, he’s trying to break down this notion of a small group identity privileged above the broader human one. The ‘we’ is everyone. He’s lumping together Iraqis, Marines, and civilians back home in precisely the sort of way that a wartime mentality rejects. And he’s rejecting the notion of according any kind of special status to the unit that has endured more — taken more losses, gone through more firefights, been hit by more IEDs. It doesn’t go over well. You’re active in the veteran writers’ world. How has that experience been? I went to NYU’s Veterans Writing Workshop, which was created by Ambassador Jean Kennedy Smith and NYU, and which introduced me to a group of veteran writers who were and are incredibly important to me. It was a space to meet with vets and argue out our ideas and trade work and discuss books. It’s also where the anthology Fire and Forget: Short Stories From the Long War began. Five of us from the program — myself, Roy Scranton, Matt Gallagher, Perry O’Brien and Jake Siegel — decided to reach out across the veteran community to solicit stories and work with the writers we found. Eventually we assembled a really strong, diverse collection of work from 14 veterans of Iraq and Afghanistan and one Army spouse. Colum McCann, who had also visited the workshop, signed on to write a preface. A lot of people didn’t think that an anthology of mostly unpublished writers would be a workable book, but we’ve been incredibly pleased with how it’s been received. Actually, the Army Times just recently called us the “Best Military Book of 2013.” And through that I’ve met with and sometimes worked with a variety of other veteran- and military-related organizations. Scott Cheshire earned his MFA from Hunter College. He is the interview editor at the Tottenville Review and teaches writing at the Sackett Street Writers’ Workshop. His work has been published in Slice, AGNI, Guernica and the Picador anthology The Book of Men. His first novel, High as the Horses’ Bridles, is forthcoming from Henry Holt. He lives in New York City.